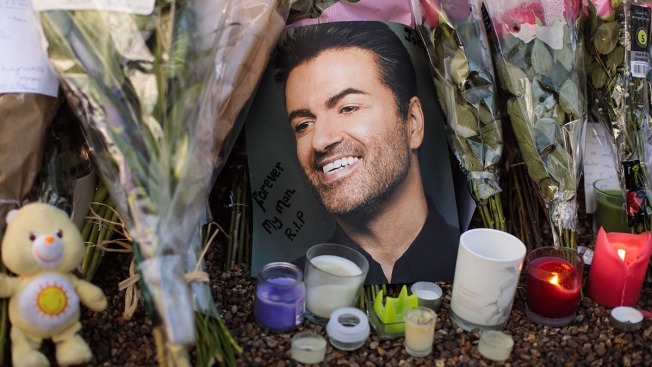 George's Michael's family is asking fans to remove flowers, photos and other tributes left outside the late singer's two homes. A grassy square across from Michael's London house is bedecked in bouquets candles, flags and handwritten messages for the singer, who died in December 2016. Similar offerings have been left outside the house in Goring, 50 miles (80 kilometers) from London, where Michael died. In a post Wednesday on Michael's website , his father, sisters and friend David Austin said they were touched by the tributes, but felt they couldn't ask neighbors "to continue to accept as normality, the memorials so personal to you all, to remain as and where they are any longer." They asked fans to remove the tributes by May 27, "leaving any you wish us to have."